Understanding the outback and its place in the collective Australian experience is a task as vast as the landscape itself. Our locals guide helps make the outback easy to understand and explore. If someone tries to sum up the Australian outback in a single pithy sentence, smile, nod politely, avoid eye contact and slowly back away. Why? Because they know not what they say and have probably never been there. Many people say the outback is “just a whole lot of nothing”. Nothing could be further from the truth. Unless your definition of nothing is a place without a Starbucks on every corner. There isn’t. In fact, there aren’t many corners at all out here. Others claim it’s in “the middle of nowhere”. A section of the Dingo Fence that stretches across 3488 miles of land. No matter the terrain, you’re always in someone’s backyard: sometimes on a horizon-swallowing, several-million-acre cattle station; always on the stomping ground of one of the hundreds of Indigenous nations that have called every inch of Australia home for 50,000 years. So, if it’s undeniably not nothing and indisputably not nowhere, what and where the bloody hell is it? First, a quick lesson about Australians: we’re an unceremonious lot, ‘laid-back’ by definition and with our definitions. 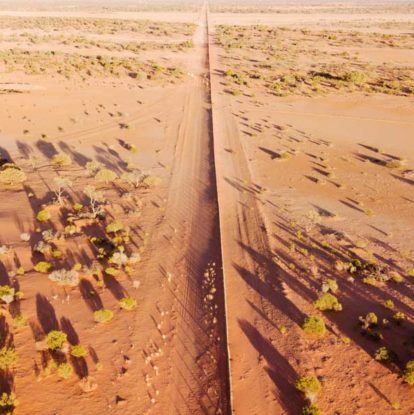 No, not even Aussies can agree on exactly what and where the outback is; so vast that it needs teams of flying doctors to service its settlements and boasts the world’s two longest fences (Dingo Fence, 3488 miles, and Rabbit-Proof Fence, 2021 miles). Yes, a little… it’s roughly the same size as the entire 48 states of continental USA, actually. Is the outback a place or a state of mind? The Australian government says the outback (officially, ‘rangelands’) comprises 81 per cent of the island continent, spreading across the country like a giant blanket. It doesn’t grace most of the southern and eastern coastline, not coincidentally where most of Australia’s big cities are located. Of the seven states and territories, only two, Victoria and Tasmania, don’t feel the outback’s hug. But who listens to government definitions? Certainly not Aussies. For us, the outback is as much an idea – an ideal even – as it is a place. Even though 85 per cent of us live within 30 miles of the coast, the interior’s wide-open spaces beckon loudly. You can read it in our books, hear it in our music, and see it in our films – just don’t believe everything you saw in Crocodile Dundee. Because every easily digestible cliché of the critter-filled, rain-shy, unforgiving “sunburnt country” has an enigmatic equal and opposite. In fact, the outback’s climate stubbornly refuses to be typecast: tropical in the north; arid and semi-arid in the fittingly named Red Centre; and more temperate down south. The mighty Kakadu National Park (which, by the way, some Australians don’t even consider outback) becomes a glowing green wonderland come wet season; a Disneyland for birders. To bring these vast landscapes to life, you must engage with those who know its stories; those who are its stories. Australia’s Indigenous ‘traditional owners’ have dwelt here for some 50,000 years and have stories for each and every animal and landform, their spiritual narrative passed on in ‘The Dreaming’ stories, which flow between their ‘countries’ (ancient cultural homelands) along ‘songlines’. You’ll see evidence of this everlasting, benevolent bond in millennia-old rock art in a remote Kimberley gorge or on a shady cliff face on the Arnhem Land escarpment. You’ll sense it at the Laura Dance Festival in Cape York (the pointy bit of Australia), where ancient performance traditions are passed through the generations, the Parrtjima ‘light festival’ near Alice Springs, and at plenty of other such annual celebrations of Indigenous Australia. Uluru in all its glory. Image via Elise Hassey. Modern Australian history, culture and identity are writ large in ‘the bush’ – a term we use interchangeably with outback and a metaphor for our free spirit, our struggles and triumphs, our unconventional characters with dry-as-Death-Valley humor. We dream of fleeing the ‘big smoke’ (the city) into the bush, to leave the scheduled life behind in our dust. While Americans flock to the Grand Canyon, we daydream of a pilgrimage to Australia’s geographical and spiritual heart, ‘The Rock’ (Uluru – formerly commonly known as Ayers Rock). While you have Route 66, we set our sights on a once-in-a-lifetime road trip across the Nullarbor Plains (literally: ‘no trees’ in Latin), which features the world’s longest stretch of straight asphalt – 90 miles with no bends! We mythologize quintessential outposts such as Birdsville (population 140), 1000 miles west from the city of Brisbane, and like to think we’ll get there, one day. Its little ramshackle-chic pub is the archetypal outback watering hole – one of the most isolated places on Earth to down a cold beer. Once a year, 7000 adventurous souls migrate to Birdsville’s annual horse races, one of a handful of outback odysseys of almost religious significance. No, they don’t. Not usually anyway. However, out in the outback, you will see ‘mobs’ of our Dr. Seuss-esque wildlife: ‘roos gracefully bounding over red dirt, as if in slow motion; emus comically sprinting along fences in the heat haze; crocs as long as a Cadillac Escalade sunbaking on muddy riverbanks. The otherworldly Mungo National Park. Yes, it’s big: big landscapes, big characters and big beasts, but don’t be overwhelmed as there are plenty of easy ways to explore our vast frontiers – even for the time-poor traveler. Uluru, smack bang in the middle of Australia, may seem like the remotest place in the universe, but you can fly there from any major city and be settled into Sails in the Desert at Ayers Rock Resort or Longitude 131° in time to watch it glow like an ember at sunset. Tucked away in the rugged far north-west of the continent, you can best access the Kimberley’s waterfalls and gorges on a luxury cruise or bespoke tour which can take you pretty much anywhere you want to go in this charmed landscape. From the South Australian city of Adelaide, you can be in the rolling Flinders Ranges, backdrop to countless Australian films, before lunch time. That’s if you don’t stop off at one of the world-class wine regions along the way. If you prefer walking in wild and wondrous places, one of the world’s great multi-day hikes, the Larapinta Trail, starts just outside the Northern Territory city Alice Springs. In the grand scheme of things, you can’t come to Australia and then miss the opportunity to experience its open, vibrant heart. Fortunately for you, there’s now no excuse. See you soon. On longer journeys carry spare tires (and know how to change them), plan your gas stops before you go, and carry plenty of food and water. As a rule of thumb, plan to carry between 1.3 to 1.8 gallons of water per person, per day. Don’t walk in the heat of the day (11am to 3pm) and always cover up: hat, sunblock, long sleeves. And carry plenty of water! Never underestimate distance and don’t trust Google Maps in remote areas. Always tell someone where you’re going and when you’ll be back. Drive after dawn and before dusk to reduce potential for collisions with wildlife. Galahs proliferate in the outback skies. Put the hood up (it signals distress), crawl under the car for shade and always stay with your vehicle. Exploring the outback by train is a perfect alternative, and a luxurious one on The Ghan and The Indian Pacific. The red rock at the heart of ancient and modern Australia, it is best to fly into either Alice Springs or Ayers Rock Airport next to Uluru. The drive from Alice Springs to Uluru is five hours so don’t expect to do make it a day trip from Alice. The best way is to undertake the Red Centre Way from Alice to Uluru via the West Macdonnell Ranges and Kings Canyon. Aim to spend two days in ‘Alice’ checking out the Desert Art Trail and exploring the Alice Springs Desert Park – take the nocturnal tour – before heading to Uluru for three days to dine under the stars on dishes infused with ancient ingredients (bush tucker) at Tali Wiru, experience Field of Lights, artist Bruce Munro’s magical installation of 50,000 spindle lights in the desert, and take a Harley Davidson tour. Stay at Ayers Rock Resort and they can take care of everything. The reddest of red ‘pindan’ dirt meets the insanely azure Indian Ocean. Five and a half hours’ drive north of Adelaide, the Flinders Ranges are an overlooked gem by not only US visitors but Australians outside of South Australia. With rolling hills that rise to the crescendo of Ikara (Wilpena Pound), the Flinders Ranges are one of the southern hemisphere’s lesser-known wonders. Go for the outback walks, prolific wildlife, and to explore (salt) Lake Eyre. Birdsville is a quintessential iconic outback town with a classic outback pub, about 18 hours’ drive west of Brisbane. Attend Australia’s most famous country races or get a taste of Aussie rock ’n’ roll at the Big Red Bash festival held under a majestic red dune. On the eastern edge of Kakadu National Park and covering an area as big as Virginia, Arnhem Land is where exquisite coastlines meet fertile wilderness. The area is also home to remote communities of Yolngu people living traditional lifestyles. Book a tour with an Indigenous tour operator like Lirrwi Tourism to see culture, art and life at its most elemental and inspirational. Mungo National Park is in the far west of New South Wales, a 13.5-hour drive from Sydney. A fossilized lake bed set in a magical landscape including the eerily atmospheric and utterly photographable Walls of China. Explore it with Mungo National Park Tours. No visit to Australia is complete without a visit to its spiritual heart – Uluru. Book at ayersrockresort.com.au to receive 10% discount on selected accommodation – use promo code CLUBUSA. Book by 30 June 2019. Discover World Heritage listed Kakadu and Litchfield national parks, experience a spectacular Red Centre sunrise, uncover the Mary River on a safari cruise and more on this 10-day Inspiring Journey.